This is a first class cruiser in outstanding condition. Electronics at the helm include Raymarine C80 GPS/depth finder, VHF, Fireboy fume detectorAM/FM remote, trim tabs and windlass. The double helm seats are accompanied by a 2 person seat across the port side. The cockpit includes a sink and refrigerator. Lots of aft seating in the U-shaped seat with table. Protect yourself from inclement weather under the camper top with side curtains. Below, you can sleep 6 in the forward V-berth, convertible sofa and the berth under the helm. Your comfort is assured by the AC, AM/FM/CD radio and TV with DVD player. The head includes a sink, shower and a vacuflush system. The wife will enjoy the fully equipped galley with refrigerator, 2 burner electric stove and microwave. 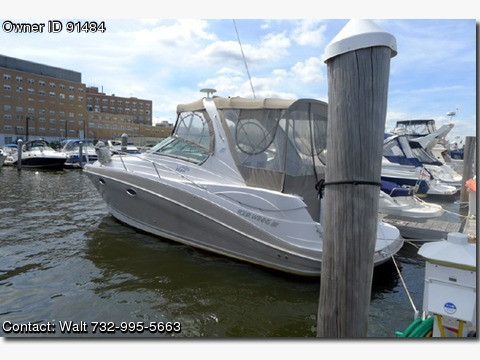 And this boat is priced very attractively.